the best possible wild life experience. The lodge has 10 comfortable chalets, set amongst green lawns and shady trees. In between drives, guests can enjoy the pool and bird watch, or relax on their private decks and watch the warthogs and the nyala families on the lawn. 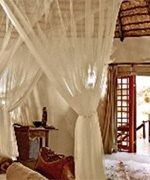 The name Motswari means "to conserve and protect" in Tswana and the owners have held the name to be a promise to each of their future friends who arrive to share in the splendour of an African sunset at this traditional African safari lodge. Sir Richard Branson's Private Game Reserve is set in the heart of the Sabi Sand reserve on the border of the Kruger National Park in South Africa. Most of our staff hail from the surrounding villages therefore guests benefit from authentic South African hospitality. We promote from within where we can, and support the local community through our charitable project, Pride 'n Purpose. The Ulusaba family of 119 individuals includes some of the finest and most qualified rangers and trackers in the reserve, who guarantee the experience of a lifetime on game drive. We delight in going the extra mile for all our guests! Ulusaba is part of Virgin Limited Edition, Sir Richard Branson's portfolio of unique retreats. A mere two-hour drive from the hustle and bustle of Johannesburg and ten minutes from Sun City, lies a place of breathtaking beauty and serenity. A place called Bakubung Bush Lodge. Concealed in the rich expanses of the malaria-free Pilanesberg National Park, Bakubung, or "People of the Hippo", offers guests everything they need to get in touch with the bush. Escapism is not only a state of mind; it's a place at the cosmopolitan Victoria & Alfred Waterfront in Cape Town. That place is The Commodore, a Legacy hotel where stylish living, excellent service and a tranquil setting comes standard. Enjoy breathtaking views of the charming ‘Mother City' from the upper floors of the hotel's superior rooms or treat yourself to cocktails on the terrace. Featuring an ideal location among five-star hotels in Cape Town, the Radisson Blu Hotel Waterfront is situated along the Atlantic Ocean, with Table Mountain and Robben Island providing a beautiful backdrop. Experience an ideal South Africa vacation at this luxury hotel, featuring a private marina and a host of Cape Town attractions nearby, including the Cape Town International Convention Centre (CTICC), Green Point Stadium and Table Mountain Aerial Cableway. The hotel's location in Cape Town offers a wonderful destination by the beach within walking distance to the Victoria & Alfred Waterfront, and provides a ten-minute walk from the central business district. The hotel also affords guests easy access to the Winelands, golf courses including Metropolitan Golf Club, and the shopping and entertainment hub of the city. For the convenience of guests at Radisson Blu Hotel Waterfront, underground and surface parking is available, as well as transfers, tours and access to major car rental facilities nearby. A complimentary shuttle is available for the Victoria & Alfred Waterfront, where a boat leaves for Robben Island.